Dingo IoT Backbone hardware – Go-IoT – The one stop solution for your IoT needs! 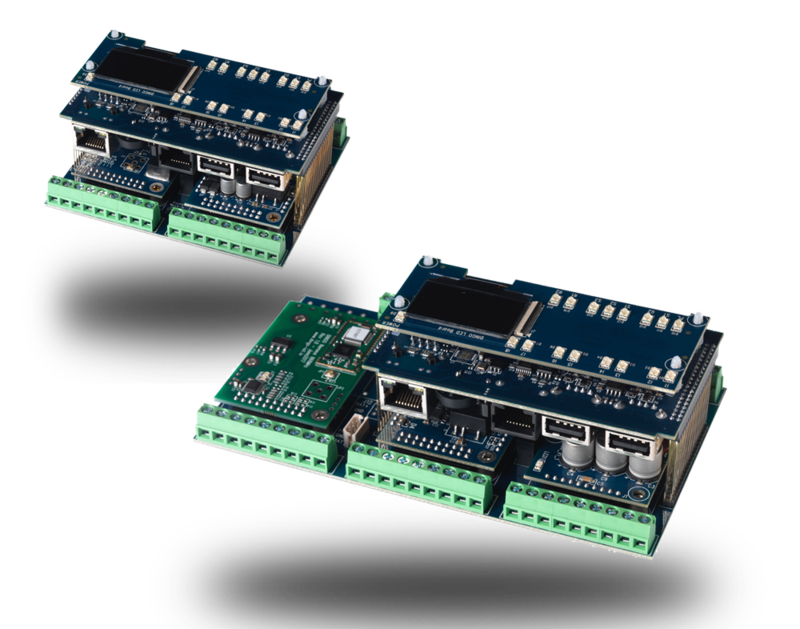 Modular hardware to build your IoT backbone box for whatever your IoT application is! DINGO IoT BACKBONE is a kind of "IoT server". 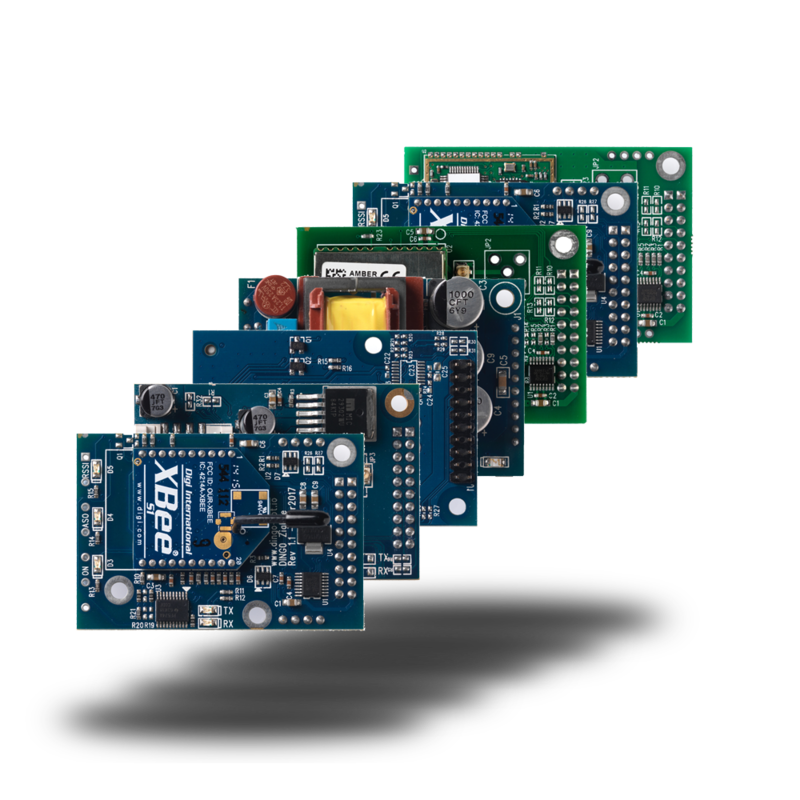 It is four interconnected electronics boards, that together can be housed in a standard industrial DIN-Rail box from different vendors, for example OKW. Each layer has a family of boards to select from. Therefore it is easy to create a custom BACKBONE for different applications or needs. At the top sits the User Interface Board (DUIB) that is visual at the DIN-Rail box front. Under the DUIB sits the computer board (DCB), the brain of the BACKBONE. The DCB holds one to 5 interface ports to the outside world (details below). At the bottom sits the Base Board (DBB) for connecting to external sensors and actuators. plus connections for holding 2 or 3 plug-ins which is the fourth layer. The plug-ins add I/O or communication specific features to the BACKBONE. A simple LED board with 16x2 LEDs. Each LED is either green or red, dimmable from 0-100%. So each of the 16 LEDs can glow in any color mixture possible of red and green. See first image with this section. 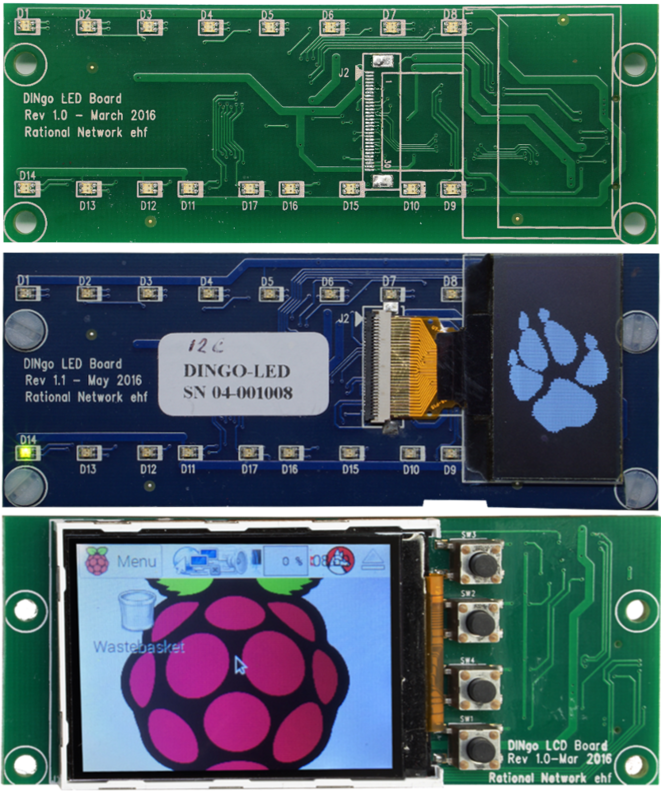 The same board as described above, but with additional OLED LCD screen of 128x64 pixels (29,5 x 14,7 mm). See second image with this section. Colour display of 320x240 pixels (59,0 x 40,0 mm) with back-light and 4 navigation buttons. See third image with this section. The DUIB connects to the underlying DINGO Computer Board via standard connector common to all types. 1xRJ45 connector that holds pins for 1-Wire, RS-485 and RS232. 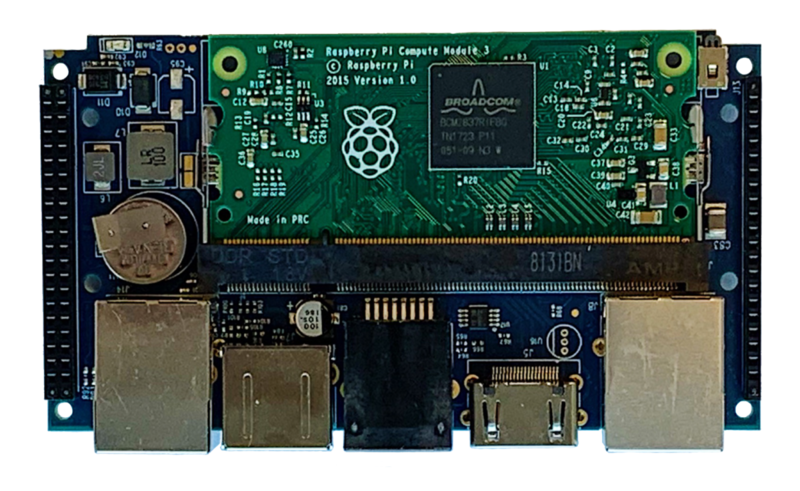 Board for Raspberry Pi COM1 or COM3 moudle. Board based on Raspberry Pi Zero. In addition to those four there is a test board intended for testing and developing for base- and user-interface boards from a normal PC computer. It actually puts your PC between the DUIB and the DBB. Suitable for most IoT controller use-cases. With RPi COM1 installed, intended for controller purpose and light Edge Gateways. With RPi COM3 installed, intended for Edge Gateways. Intended for low cost controllers. 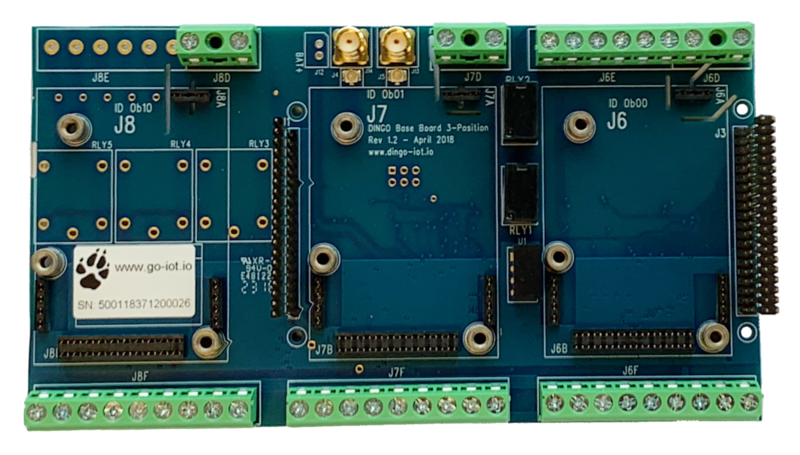 The Base Board (DBB) provides the I/Os to low-voltage sensors/actuators on one side and high voltage connectors at the other side for power, relays and PINGO plug-in when installed. In addition the DBB contains 2, 3 or 4 sockets for special purpose plug-ins, discussed below. The DBB holds a 40 pin plus a 20 pin connectors to the DCB above it. Those connect miscellaneous connectors to the DCB, including GPIOs, I2C, SPI, CAN, serial ports, USB, etc. The DBB is open-source. Everybody can create their own or have us to help them with that. Plug-ins add special functionality to the DINGO BACKBONE. This includes, wireless communication of various types, PINGO, real-time co-processor , simple things like RS-485 connectivity, or internal power-supply. Plug-ins may or may not have external connectors on the DBB. Currently DINGO IoT provides 21 different plug-ins. Third parties are welcome to design their own plug-ins for the DINGO BACKBONE. The DINGO BACKBONE can be boxed in standard DIN-Rail box or any custom box you want. We offer modular boxes fitting the DINGO BACKBONE. There are three types of standard boxing that we offer today but if there's a need, we can satisfy it. 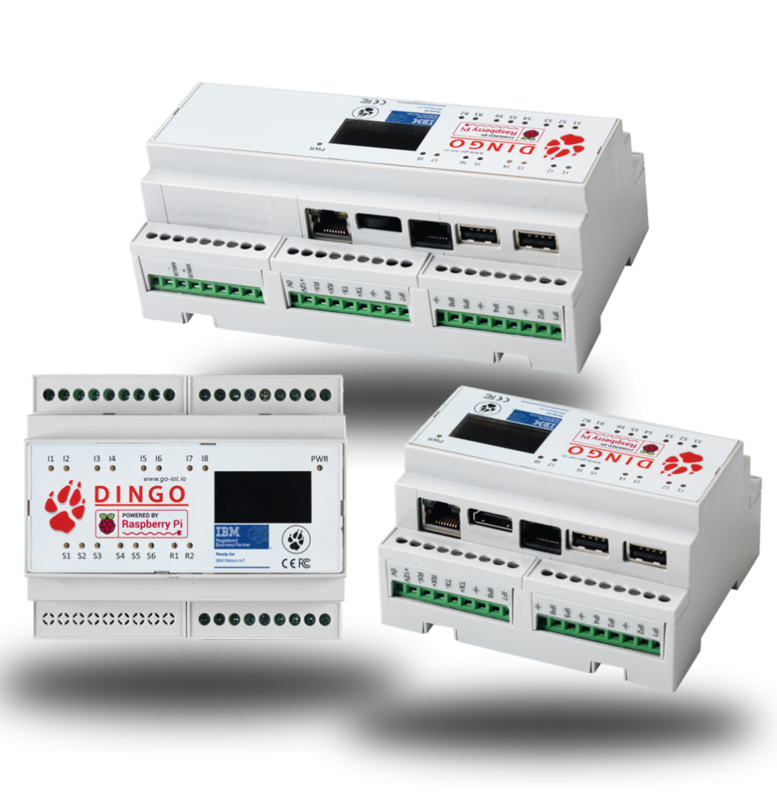 The DINGO can be fitted in a 2 station 3 station and a 4 station DinRail enclosure. The boxes are modular such that the terminal-covers can easily be customized to show what is open and what is closed. The boxes have openings fitting the connectors of the DCB (Ethernet, Multi-port, HDMI and USB ports). The top cover is either transparent or with openings fitting each type of DINGO User Interface board.